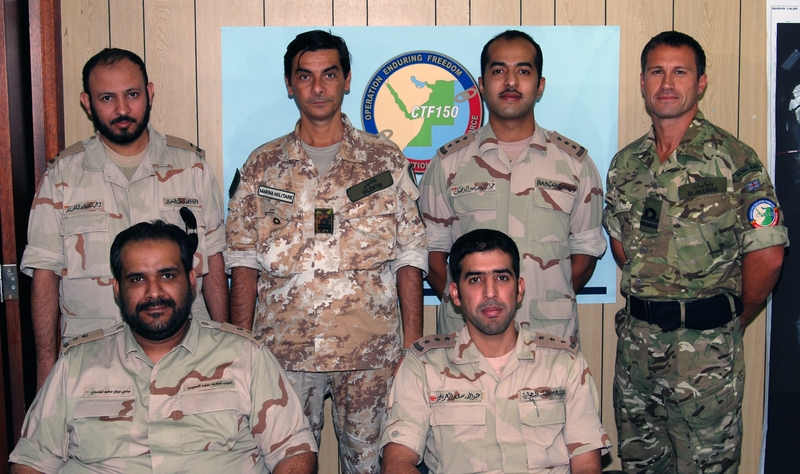 Combined Task Force -150 (CTF-150) Headquarters in Bahrain recently hosted four Royal Saudi Navy Force (RSNF) officers for two weeks of Command and Control (C2) training at the invitation of Commodore Clink Royal Navy, Commander of CTF-150. This is the first course of an enduring C2 programme aimed to maintain the cooperation between Combined Maritime Forces (CMF) and RSNF through the exchange of information and experiences. Commander Al-Gahamdi, Lieutenants Al-Dekhyyel and Al-Areifi and Warrant Officer Al-Amri used the opportunity to familiarise themselves with CMF and CTF-150 organisations, their missions and Area of Operations, and issues currently experienced in the fight against maritime terrorism and illegal activity. After being welcomed by Commodore Clink, a series of briefs by CTF-150 staff followed; these included their roles within the headquarters, the compilation of a ‘real time’ maritime picture, information exchange techniques with coalition and regional navies, intelligence assessments and practical computer demonstrations. CTF-150’s mission is to deter, disrupt and defeat attempts by international terrorist organisations to use the maritime environment as a venue for attack.